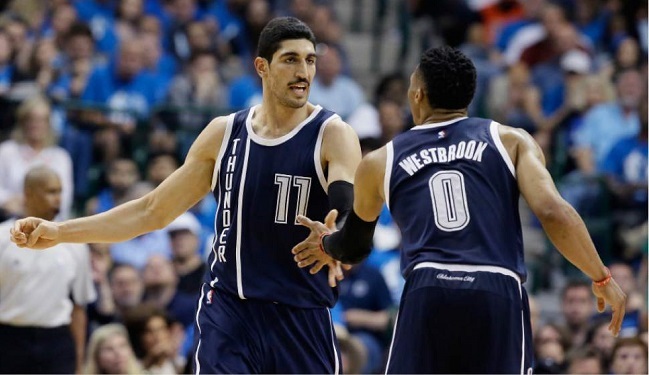 OKC Thunder center Enes Kanter (left) with teammate Russell Westbrook. If you threw up your hands in frustration, swore off the NBA this past summer and haven’t paid attention since then, you may be surprised to learn that the league is still up and running after Tuesday’s regular-season openers. Back in July, when former league MVP Kevin Durant left the Oklahoma City Thunder to sign with the defending Western Conference champion Golden State Warriors as a free agent, there was a loud segment of fans and media that predictably overreacted and declared the NBA dead and buried. By adding one of the league’s best players to one of the league’s best teams, the Warriors had allegedly stacked the deck and were now playing unfair. They had allegedly made all but a couple of the league’s 30 teams irrelevant and incapable of truly competing for a championship. Parity no longer existed. Competitiveness was a thing of the past. The NBA was finished, and KD drove in the final nail. Thing is, we’d heard this same kind of morbid diagnosis six years ago, back when LeBron James and Chris Bosh left Cleveland and Toronto, respectively, to join Dwyane Wade on the Miami Heat. That collaborative power move created what became known as a “super-team,” and it was — like Durant going to Golden State — also viewed at the time as something that would destroy the league as we’d known it. And yet here we are today, and the NBA is not only surviving, but thriving. Television ratings are up, jerseys and sneakers and other merchandise is still flying off the shelves, league and team revenues are skyrocketing — just look at some of the huge contracts that were signed in free agency this past summer. There have been five different NBA champions in the six years since LeBron and Bosh’s 2010 move, so parity is apparently still a thing. And what happened on this season’s opening night? Durant and the Warriors were blown out by the San Antonio Spurs. So contrary to earlier reports, there are some teams out there who can beat the Bay Area’s super-team. Another team that could pose a challenge to the Warriors is Durant’s former team, the OKC Thunder. While they’re obviously less talented without Durant, OKC is still a threat led by superstar point guard and MVP candidate Russell Westbrook. Two of Westbrook’s teammates and possible Thunder starters are Muslim: center Enes Kanter and forward Ersan Ilyasova. Both players are of Turkish origin and both played professionally in Turkey earlier in their careers. 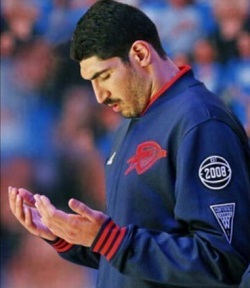 While Ilyasova has not been very public about his faith, Kanter is perhaps the league’s most outspoken Muslim player when it comes to religious and cultural issues. Kanter used social media to both support fellow Muslim NBA player Dion Waiters and educate the public about Islam in the aftermath of a 2014 incident in which Waiters was (wrongly) reported to be sitting out the U.S. national anthem due to his Islamic beliefs. Kanter has also helped introduce some members of the NBA fraternity and the NBA fan base to halal food. And unfortunately, Kanter headlines this offseason when he revealed that he had received death threats due to his criticisms of the Turkish government. There were also reports that Kanter’s family in Turkey had disowned him over these politics, and that Kanter was considering changing his last name. Aminu was supposed to play for the Nigerian national team at the 2016 Summer Olympics in Rio. But he pulled out on the eve of the Games, reportedly due to the Nigerian sports federation being unable or unwilling to insure his NBA contract. Totally understandable from a business perspective, but that decision probably cost Aminu some fans in his parents’ native country. It certainly cost Nigeria its best chance to make some noise in the Olympic tournament. Aminu now turns his focus to helping the Blazers make some noise in the NBA’s tough Western Conference. In his first season with Portland (his fourth NBA team since being drafted 8th overall in 2010), Aminu averaged a career-high 10.2 points per game to go with 6.1 rebounds and 1.2 steals. The Blazers were one of the league’s surprise playoff teams and advanced to the conference semifinals before losing to the Warriors. 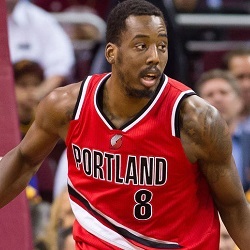 In that series, Aminu stepped his game up from the regular season and averaged 17.2 points and 8.4 rebounds. Now entrenched as an important part of the Blazers’ foundation, Aminu has been picked by some league analysts as a player poised to have a breakout season. It seemed like every player on the Pelicans missed a significant portion of last season with one injury or another. By missing “only” 14 games with a calf strain, Asik was something of an iron man by NOLA standards. His 64 starts (in 68 appearances) were the most of anybody on the team, even more than superstar power forward Anthony Davis, whose injuries limited him to 61 starts. 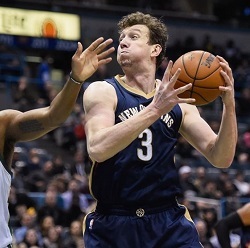 Asik also led the Pelicans in field-goal percentage last season, connecting on 53.3 percent of his shots. That number is so high mostly because Asik doesn’t shoot the ball often. When he does, it’s usually on a put-back of an offensive rebound or when a teammate finds him open right in front of the rim. Defense and rebounding (6.1 rpg) are Asik’s calling cards. The 30-year-old from Turkey has carved a niche in the NBA as an enforcer / “dirty work” complement to All-Star big men such as Joakim Noah in Chicago, Dwight Howard in Houston, and now Davis in New Orleans. If Minnesota’s Karl-Anthony Towns is supposed to be the next Tim Duncan, Dieng would do pretty well for himself to emulate a late-career version of David Robinson, the other half of the Spurs’ “Twin Towers” tandem with Duncan. Double-digit points, seven or eight rebounds, and doing whatever else it takes to help KAT shine on the front line will earn Dieng long-term job security in the league. Matching last season’s stat line of 10.1 points, 7.1 rebounds and 1.2 blocks per game as a part-time starter would be great for the 6-foot-11 Dieng. Dieng started at center in Minnesota’s season opener, with Towns at power forward. Between now and the end of the season Dieng could also find himself playing power forward, with Towns at center. The Wolves are a young team trying to find its identity in the wake of franchise cornerstone Kevin Garnett‘s retirement, so roles are still being defined. Whatever his role may be, Dieng will be an impact player for the up-and-coming Wolves with his rebounding, defense and underrated passing skills. Last season was supposed to be the one in which Faried made the leap from All-Star potential to All-Star production. And so was the season before that. In fact, I wrote almost exactly that same opening sentence about Faried in this space one year ago, and the leap still hasn’t happened. Faried was good last season. He averaged 12.5 points and 8.7 rebounds, almost exactly the same numbers he put up the previous year. But the Nuggets again weren’t within shouting distance of a playoff spot, and Faried’s name again popped up in trade rumors constantly. As he enters his sixth NBA season, Faried (again) seems to be at a make-or-break time crossroads. Will he establish himself as an untouchable (i.e., un-trade-able) piece of Denver’s rebuilding project, or will the Nuggets send the 26-year-old and his sizable salary somewhere else to focus on their younger players? Denver head coach Mike Malone has already changed Faried’s role, deciding to bring him off the bench as the sixth man. Faried’s boundless energy, uncommon athleticism and marketable, fan-friendly persona should make him attractive to just about any team in the league if they’re willing to pay the price. They, like the Nuggets, are surely waiting to see if or when Faried will put it all together and begin fulfilling his potential to be great. Ilyasova is on his third team in the last year. In June of 2015, he was traded from the Milwaukee Bucks to the Detroit Pistons. Despite starting every game for Detroit (an eventual playoff team) through the first half of the season, Ilyasova was traded to the Orlando Magic and finished the season coming off the bench for a Lottery team. Then in June of 2016, Orlando traded Ilyasova (10.4 ppg, 5.4 rpg) in a draft-night deal to Oklahoma City. Standing 6-foot-10 with a tough mindset and having developed into a good outside shooter, Ilyasova can play small forward or power forward. He is part of a three-man forward rotation with defensive stopper Andre Roberson and rookie Domantas Sabonis, and could wind spending a lot of time in Durant’s old position or playing closer to the basket as a power forward. Either way, by landing on the Thunder, Ilyasova appears poised for the first time in his NBA career to advance beyond the first round of the playoffs. Kanter averaged 12.7 points and 8.1 rebounds per game last season coming off the bench, and finished third in the NBA’s Sixth Man of the Year award voting. He ranked fifth in the league in offensive rebounds, fourth in field-goal percentage and was 10th in Player Efficiency Rating. Kanter is good enough to start for about half the teams in the league, but in OKC he basically shares the center position with Steven Adams, his comedy partner in the fan-favorite duo known as “The ‘Stache Brothers.” Kanter is the better offensive player, while Adams excels on defense. Although Adams starts and Kanter is the backup, Kanter only played four fewer minutes per game than Adams last regular season. That gap widened in the playoffs, however, with Adams playing about 12 minutes per game more than Kanter. While it’s common for bench players who are good enough to start to become frustrated and either ask for a trade or leave in free agency, Kanter seems happy and settled in OKC. He is entering the second year of a four-year, $70 million contract, and he has said the team’s efforts to accommodate his Muslim faith have helped him feel at home. Mejri is an NBA anomaly in more ways than one. Following a nine-year career overseas, Mejri was a 29-year-old NBA rookie last season. He is also the first-ever NBA player from Tunisia, a Muslim-majority country in North Africa. Before coming to the NBA, the 7-foot-1 Mejri played pro ball in Tunisia, Belgium and Spain; most recently for Real Madrid in Spain’s top pro league. He saw limited action with the Mavericks in his first NBA season, averaging 3.7 points and 3.6 rebounds while appearing in less than half of Dallas’ games. He showed some flashes at times when he did get extended playing time, though. 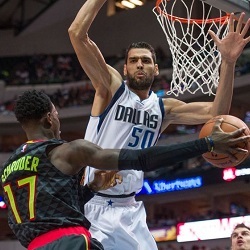 Mejri had three double-doubles during the season — including a 13-point, 14-rebound, 6-block stat line in a March victory over the Trail Blazers — five games with at least three blocks, and he had a 12-point, 3-block game against the Thunder in the first round of the playoffs. 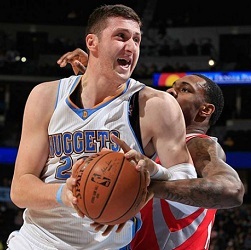 Kenneth Faried could be traded by the Nuggets at some point this season, but the odds are slim that Denver is going to part ways with Nurkic, a 22-year-old from Bosnia & Herzegovina who has been pegged as a vital part of the team’s rebuilding plan and youth movement. Injuries limited Nurkic to just 32 games last season, in which he averaged 8.2 points, 5.5 rebounds and 1.4 blocks. The highlight of his season was a 15-point, 10-rebound, 5-block effort in a January victory over the Timberwolves, where in just 22 minutes on the court Nurkic played better than Towns (the eventual NBA Rookie of the Year), Dieng and Garnett. Like Kanter and Dieng, Nurkic is half of a twin-towers tandem with another budding young standout, 21-year-old Nikola Jokic from Sebia. In the Nuggets’ season opener, Nurkic and Jokic started side-by-side. What looked like a delusional and ill-advised declaration one year ago worked out perfectly for Schroder. In an interview with German magazine Bild prior to last season, Schroder basically said that if the Hawks weren’t going to make him their starting point guard, he wanted the team to trade him. Considering that Atlanta already had a certified All-Star starting point guard in Jeff Teague who had just led the team to a 60-win season and a Southeast Division title, it seemed highly unlikely that Schroder would get that starting job. I wasn’t the only person who predicted it was only a matter of time before Schroder was traded by the Hawks. But shortly after a season in which Teague averaged 15.7 points and 5.9 assists, Schroder averaged 11.0 points and 4.4 assists, Atlanta’s win total dropped from 60 to 48 and the team was swept out of the playoffs for the second year in a row by LeBron and the Cavaliers, the Hawks traded Teague to the Indiana Pacers and handed the keys to Schroder. 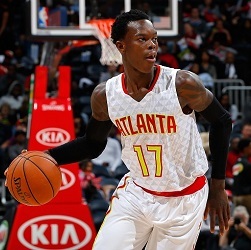 And then on Wednesday, Schroder and the Hawks agreed to a four-year contract extension worth a reported $70 million. So what will the 23-year-old Schroder do now that he’s officially the man in Atlanta? Schroder is adept at getting past his defender into the lane and creating shots for himself or for his teammates. He is a long and active defender. He needs to improve his jump shot and his ability to finish when he gets to the rim, but he has serious potential to be an All-Star like Teague was for the Hawks. And he’ll be getting help from 8-time All-Star center and 3-time Defensive Player of the Year Dwight Howard, whom the Hawks signed as a free agent. Schroder is going into this season as a popular pick to win the NBA’s Most Improved Player award and could even challenge for a spot in the All-Star Game. Two seasons ago, Teletovic almost lost his basketball career and his life when he was diagnosed with blood clots in his lungs — the same condition that is currently this/close to ending Chris Bosh’s career and nearly took the life of former college football player Shaykh Qasim Hatem. That is almost all forgotten now, as Teletovic was medically cleared to resume his career and played all of last season for the Phoenix Suns without incident, averaging a career-high 12.2 points and hitting a career-high 39.3 percent of his three-pointers. Over the summer, Teletovic signed a free-agent deal with the Bucks, where he’ll be expected to stretch the floor as a catch-and-shoot specialist for a squad that features young and athletic offensively talented players such as Jabari Parker, Giannis Antetokounmpo, Greg Monroe and rookie Thon Maker. Over the past two seasons, Waiters has played alongside some of the best scorers in the league: He was teammates with LeBron and Kyrie Irving in Cleveland, then with Durant and Westbrook in OKC. Now he is replacing another one of the league’s best scorers as he assumes the Heat shooting guard job vacated by future Hall of Fame superstar Dwyane Wade. Wade surprisingly left Miami as a free agent this past summer to sign with the Chicago Bulls. Suddenly needing to fill a huge void on the roster, the Heat signed Waiters. During a free-agency period in which salaries skyrocketed and even little-used role players were signing contracts worth tens of millions of dollars, Waiters signed an oddly modest two-year, $5.9 million deal. But if Waiters (9.8 ppg) takes advantage of this opportunity and plays like the explosive scorer he was at Syracuse University that was picked 4th overall in the 2012 NBA Draft, he’ll put himself in position to sign his own massive contract soon enough.